One of the benefits of dinner meal planning is that if you get the portions just right you know you will also have lunches for a few days and that was sort of the theme for this week's menu. Leftovers! Sunday our neighbors had a BBQ and we reaped the benefits despite having to duck out early because of work and nap time. 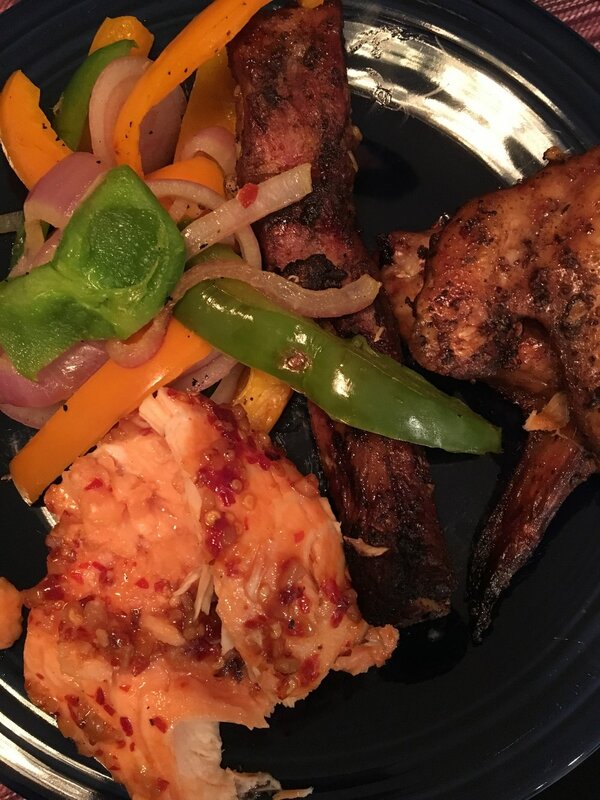 So we combined the ribs and wings with our planned "Chili Lime Salmon and Grilled Veggies," which meant lunch for me on Monday! Monday we had a fantastic grilled steak salad. I'm really into having a salad once a week for dinner these days. I feel like it's a nice way to keep it light. Tuesday was a hectic day. Dylan was home sick and I was trying to balance caring for her and working. So by the time dinner rolled around I was pretty exhausted. Thankfully we had these mini turkey meatloaf muffins on the menu and we had premade them on Sunday. All we had to do was steam the brocolli and reheat. They were super moist still too. Wednesday is often what I call "crockpot" day in our house. I like that you just have to dump and walk away and that seems to suit hump day just fine. We had "non chicken pot pie." It is a much lighter way to get your pot pie fix and I am a sucker for biscuits. 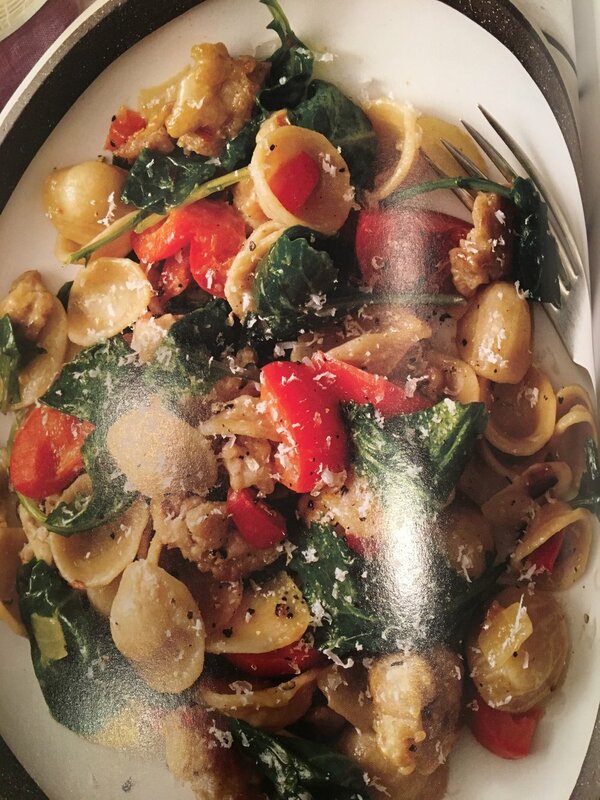 Thursday we had our latest obsession "orecchiette with spicy sausage, pepper and kale." This dish is so tasty. It has everything you could want in a non sauced pasta dish. It doesn't feel too heavy and it fills you up so well. I get so excited to eat this that I don't even waste time taking pictures. So here's what t looks like from the SkinnyTaste cookbook. Friday I was traveling so Josh had Thursday night leftovers and I housed sushi at JFK while I waited to board. Saturday we had takeout from a local Greek restaurant. It's a fave.